Joy was homeschooled K-12 in the days before it was popular, and has homeschooled her 2 children since their infancy. She has no regrets. 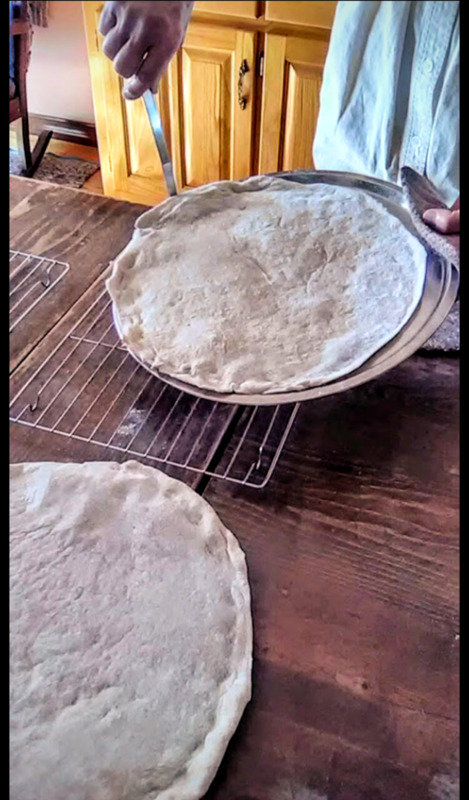 Billy and Tyger help make whole-wheat tortillas. As soon as my daughter Tyger could scootch about, she demonstrated that she was purposeful in her views of the world. She wanted what she did to matter. "Waste not, want not" seemed to be her theme—yet everything needed to be fun, too. So it was that, when she got a bit older, she would draw and color a detailed picture—then punch a ragged hole in it, tie a tail of yarn through the gash, and whip it about in our Great Plains breezes, calling it a kite. She was satisfied having a beautiful kite—never mind that her masterpiece got crumpled and burr-bedraggled before the hour was out. This attitude continued to confound me, and I thought at first that she was wasteful in her tendencies. When I drew a picture, I wanted it preserved for posterity. But then I began to see that she had a kind of wisdom—an ability to live in the moment with total abandon, which I lacked. This attitude extended into many areas. One area in which it was piercingly clear was in Tyger's refusal to have anything to do with play-dough or other traditional child's molding materials. She grew grim-faced and unpliable as the old clay I recalled molding at my Grandmother's when I tried to present her with such toys. But she took to bread doughs immediately. Why? She was a child who regularly broke any rules and expectations of those around her and seemed to take discipline as a matter of course. Yet she was not an unhappy or particularly defiant child. In fact, she was a singing, sweet-tempered butterfly of a girl, albeit at times like a stick of dynamite. So why the refusal to enjoy what seemed to come naturally to so many of us? Was it because she couldn't eat the product? No - I made homemade playdough, so she could nibble if she wanted. Was it because the stuff smelled unpleasant to her? Probably not - judging by what I caught her playing with and eating outside. So what was the reason? Then it came to me - she wanted her results to be useful. When she drew a picture, she turned it into something dynamic and nearly alive—a kite, or a hat, or a bracelet, crown, or a basket for dandelions and wild roses. When she made up stories, it was always with an eye to the fun that the characters had, or to the disasters they turned to their advantage. That was it, then - play-dough was not useful. You could make nothing out of it besides a droopy shape to be squashed and formed again. 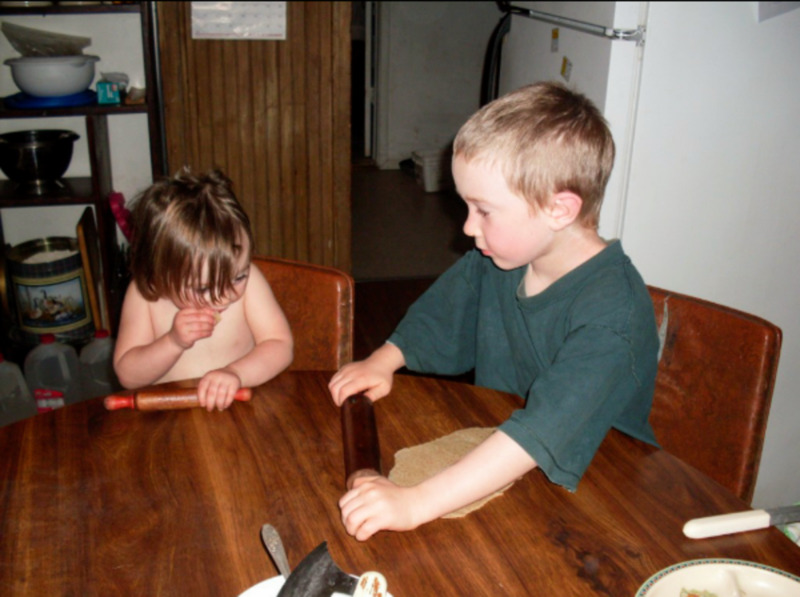 When next I made tortillas, I gave her a lump of dough and a tiny rolling pin. She ate half her allotment raw and rolled the other half into a barely-edible, grizzled-looking slab, many times folded, pounded, peeled up from the table, and squashed. But she was satisfied. I made a practice of letting her "help" whenever I made bread from that point on. 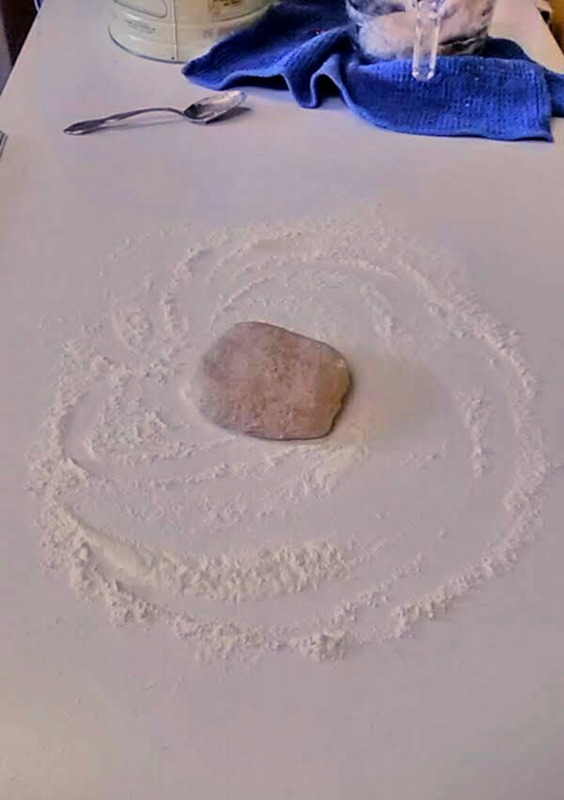 And not only did she begin to learn to make pancakes, yeast bread, tortillas, doughnuts, and cornbread as soon as she could walk, she also began playing with play-dough. Just for the practice of the thing, you know. 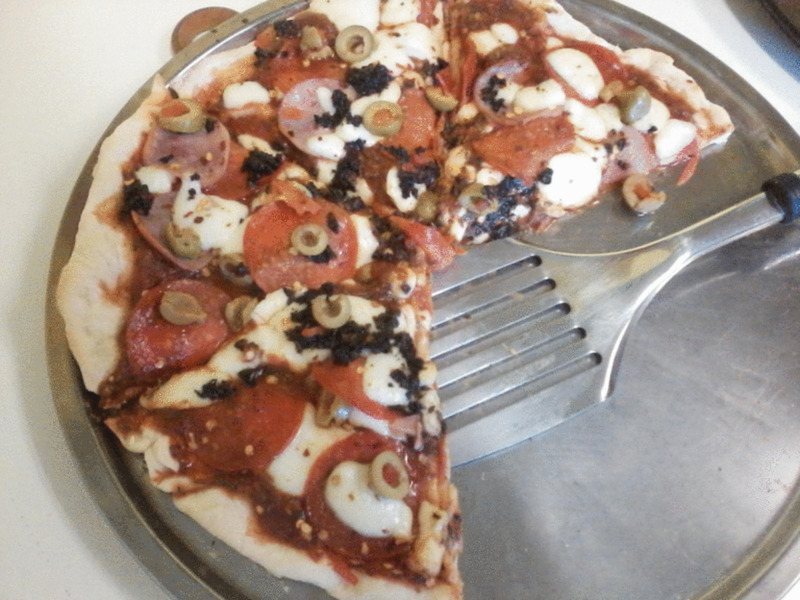 The pizza dough recipe given below is not only quick but is as easy as they come. 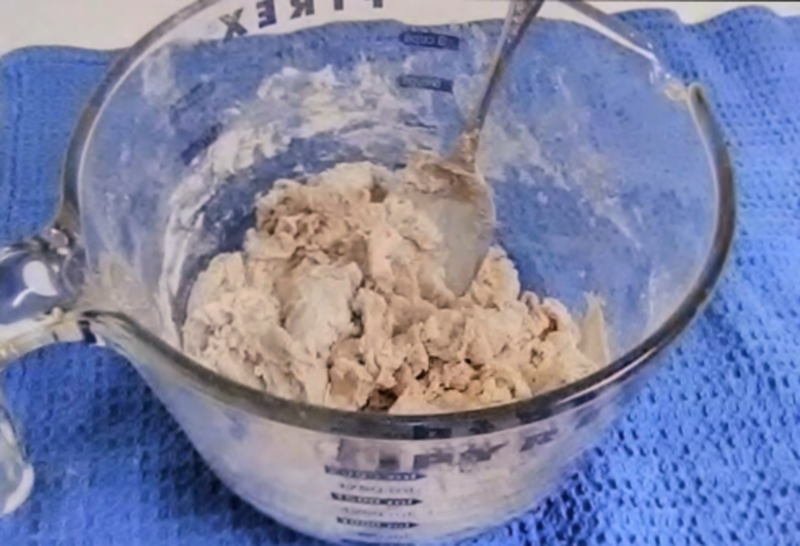 It can be mixed by hand and formed in as little as 15 minutes...though a better, more workable dough will be achieved by taking more time. Of course, if you wish to let the dough rise properly, the required time will increase by as much as an hour. But you don't have to allow this dough to rise - not even once, beyond the time it will take to rest the dough for rolling. It is still plenty good the quick way. 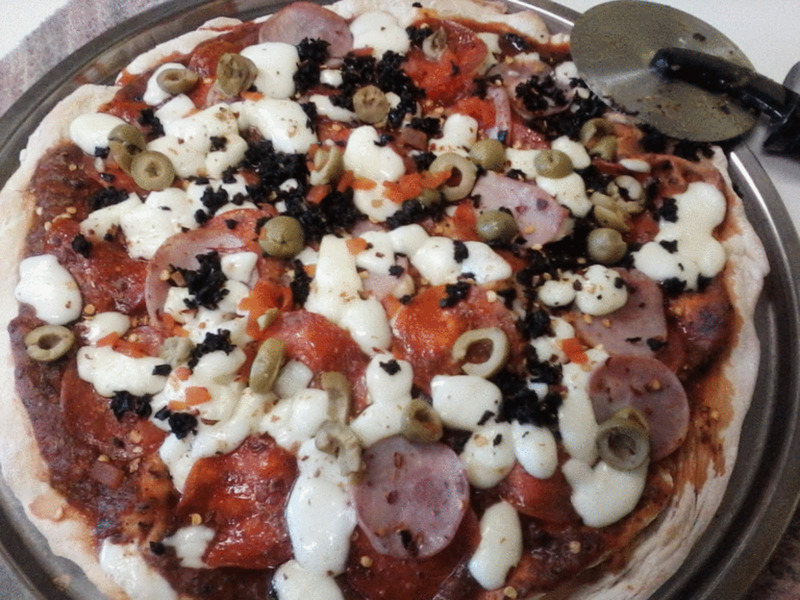 You should decide what toppings you wish to use before mixing the dough, and you can streamline the baking process by shredding or slicing cheese, cutting olives and onions, etc. beforehand. 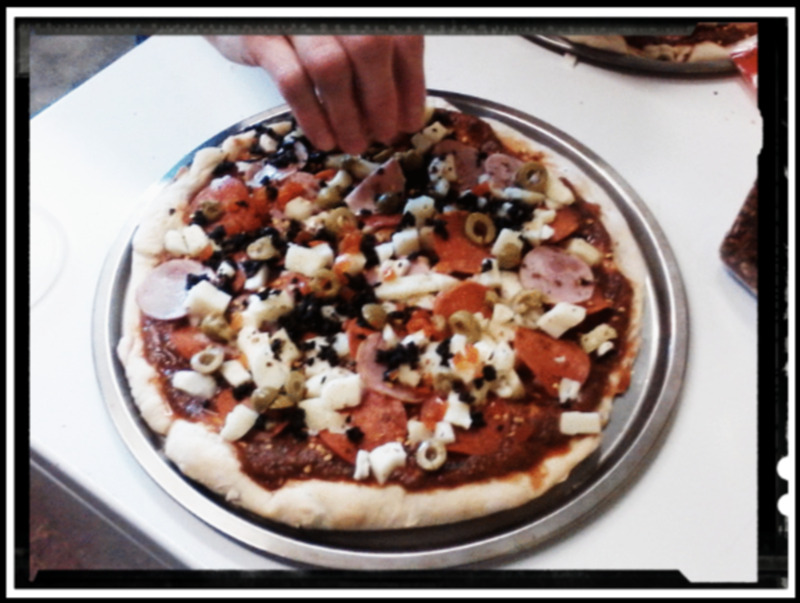 Most toppings can be kept in readiness in the refrigerator for a day or two before assembly. 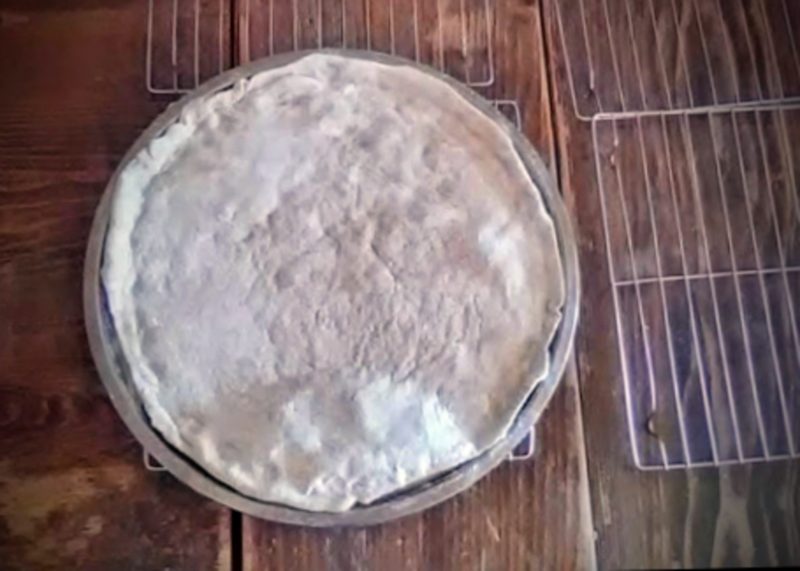 If you want a more developed dough, you may allow it to rise until doubled, with the mixing bowl set in a warmish place and covered either with a damp tea towel or plastic wrap. When you touch the dough, your finger should leave a soft indent, and the dough will feel spongy. Proceed with rolling, baking, and topping as usual. 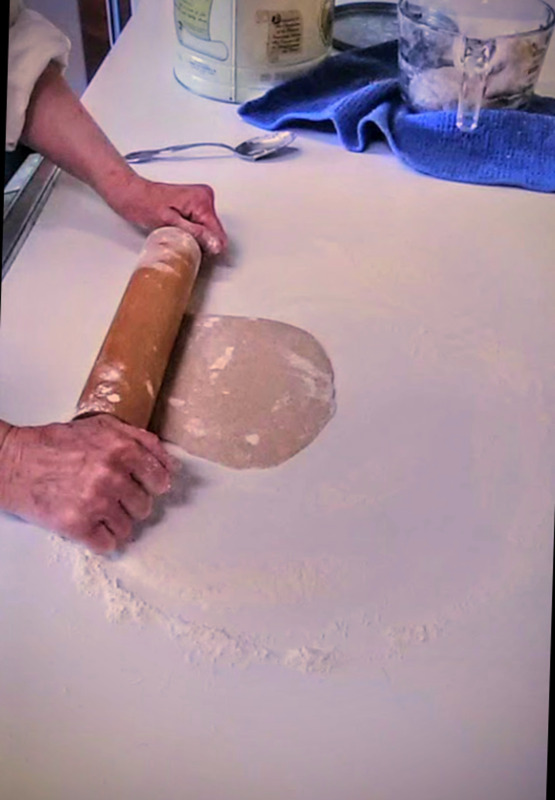 If you have no rolling pin, a beverage can (room temperature) may be used to roll dough flat. 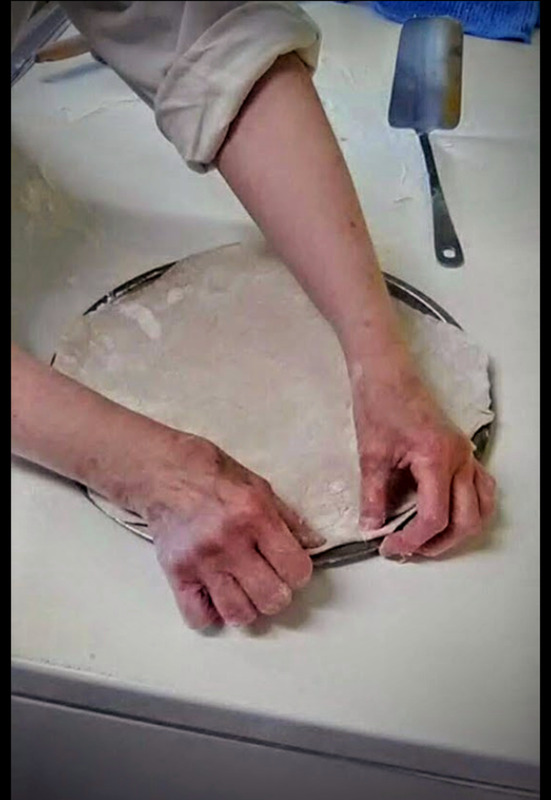 Or, you may push, press, and stretch each crust into place with your hands. 1 cup Water, Warm, 110* F.
Add flour(s) and salt. 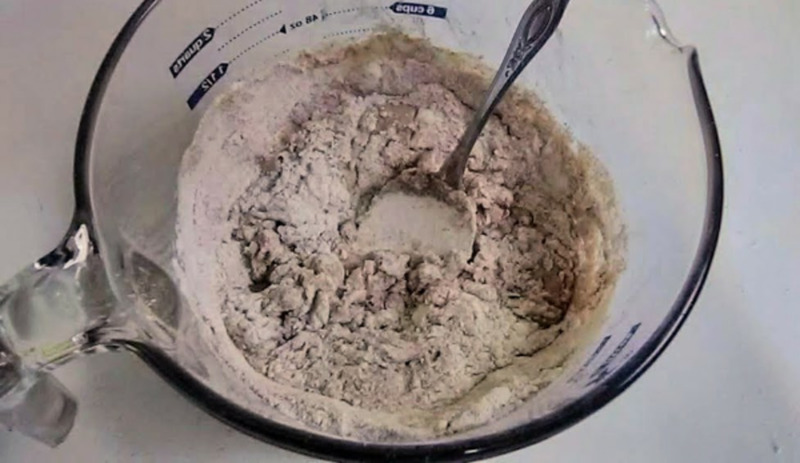 Mix until flour is incorporated. The dough may be lumpy and still fairly floury. 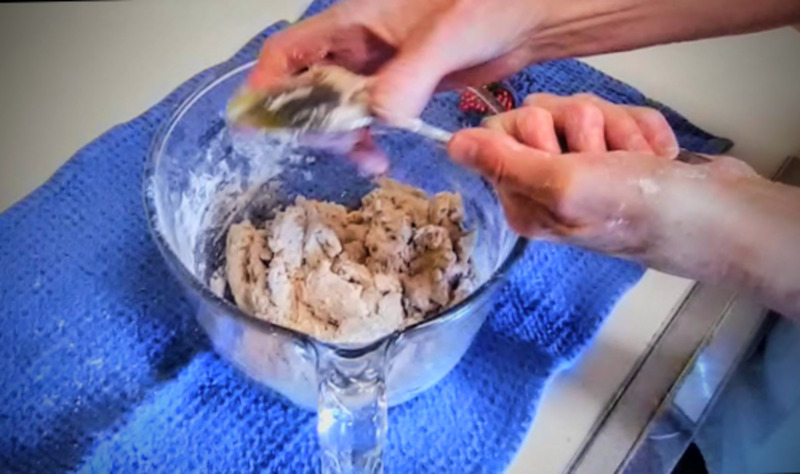 If the dough is really dry, add literally just a dribble of water, and mix it in thoroughly, using mostly your hands. If it is very sticky, with long, wet strings of dough, add a sprinkle of flour, and mix and knead in. 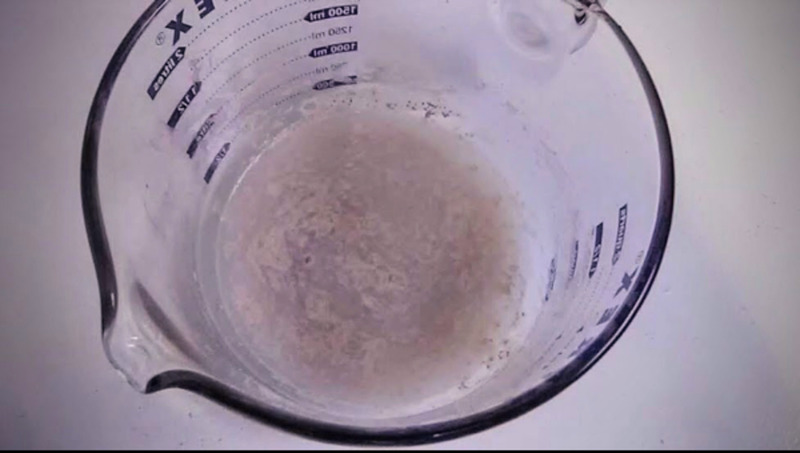 Yeast, sugar and water have been put together. The yeast is activating, becoming soft and frothy. 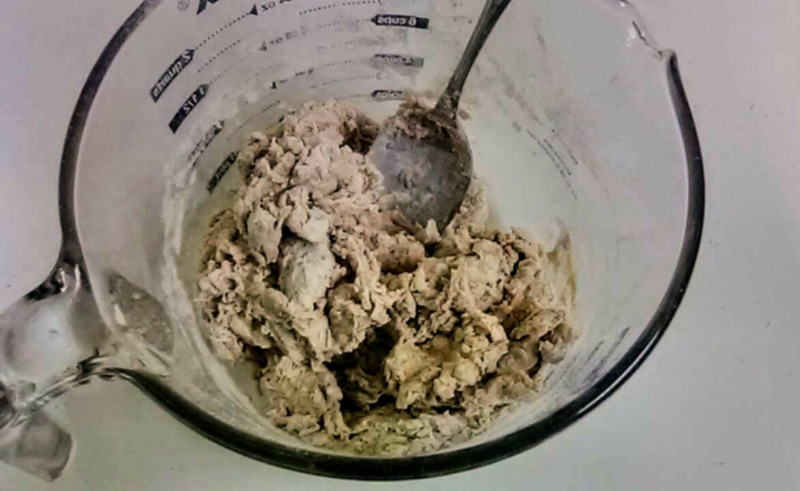 We used home-ground, whole wheat flour for half the amount of total flour. This makes the crusts heavier, but tastier and more healthy. Beginning to mix all ingredients. The dough is coming together pretty well here. Another view of the dough, ready to knead. The dough is quite tacky, but not obnoxiously sticky. 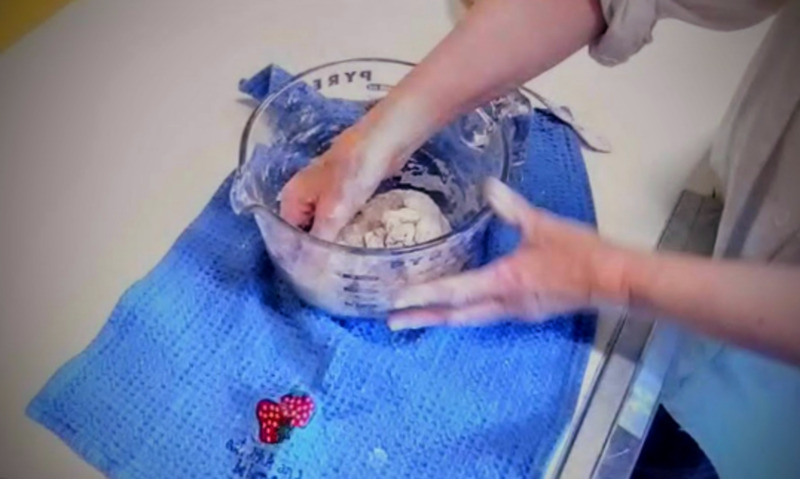 Gather the dough into a ball. 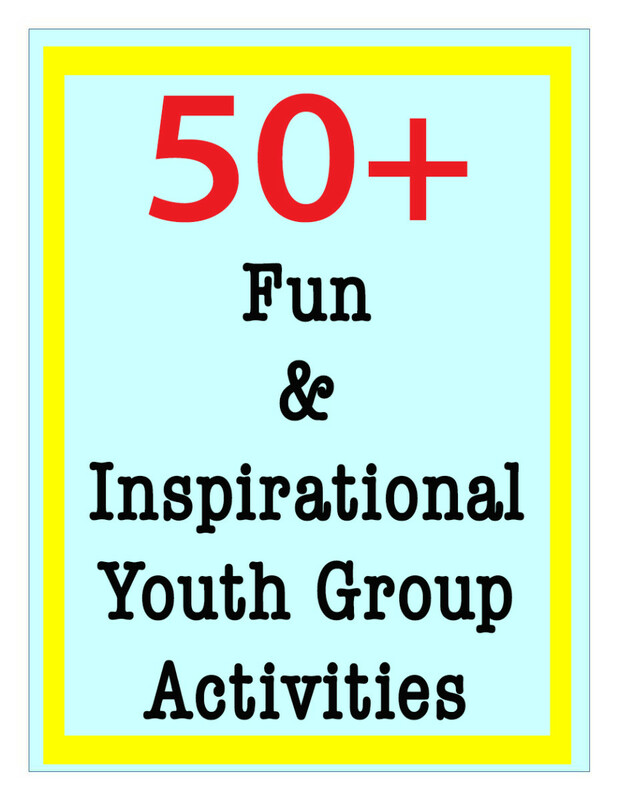 There will probably be plenty of flour yet in the bottom of your mixing bowl. Beginning kneading. 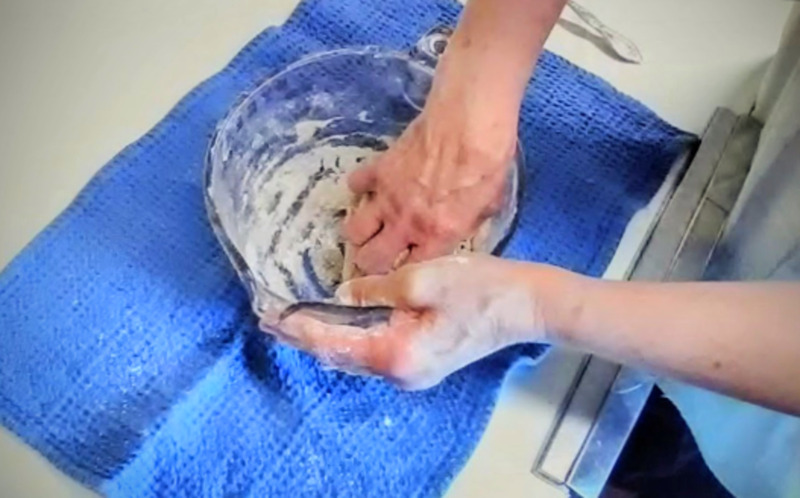 An experienced kneader can easily knead this dough right in the bowl, using mostly their knuckles...but if you wish, you may take it out and work it as shown in the video. 1. Roll on lightly floured surface, to about ½” thickness. Rolling right on the oiled pizza pan usually works well. 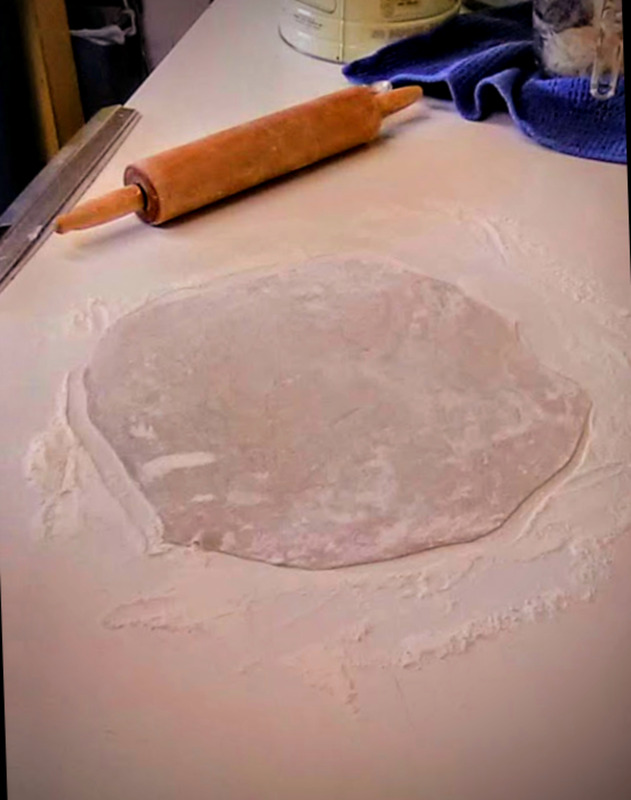 If you can't do this, roll the dough on a smooth surface, then fold it in quarters for transfer to the pan. 2. Unfold and smooth and stretch it until it is even and as thin as you want. 3. For thicker crusts, prick with a fork at about two-inch intervals, before pre-baking. 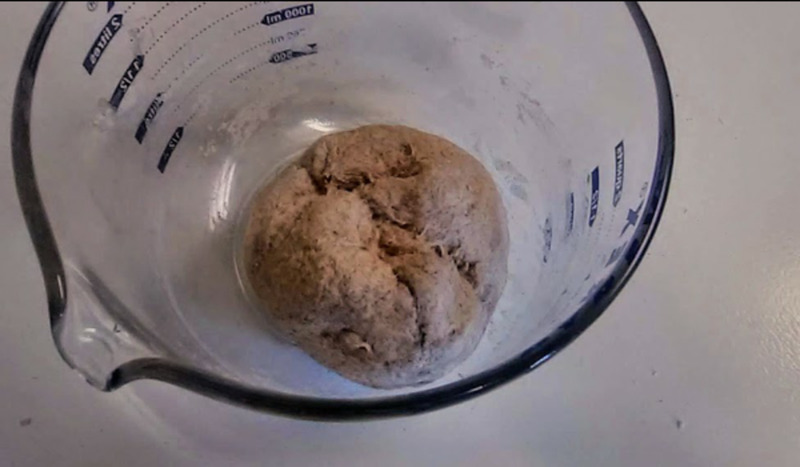 The dough ball has rested about five minutes, and is ready to roll. You may not need this much flour. 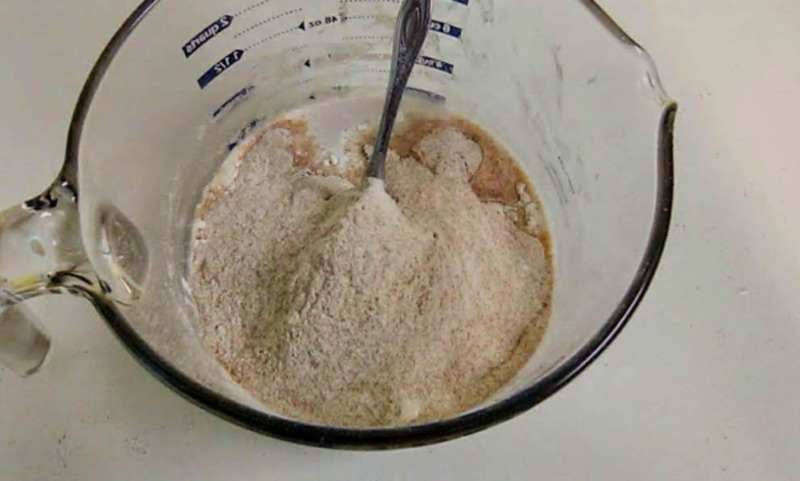 Push extra flour off to the side, keeping your working surface only sparsely covered. 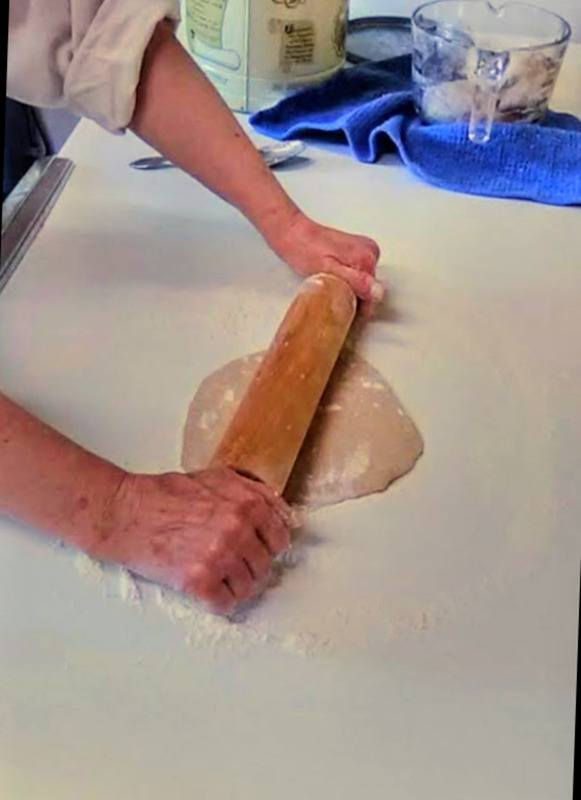 With the rolling pin of your choice, start in the middle of the flattened ball, and work outward, aiming for whatever shape will fit your pan(s). ...to round. This crust is ready to transfer. 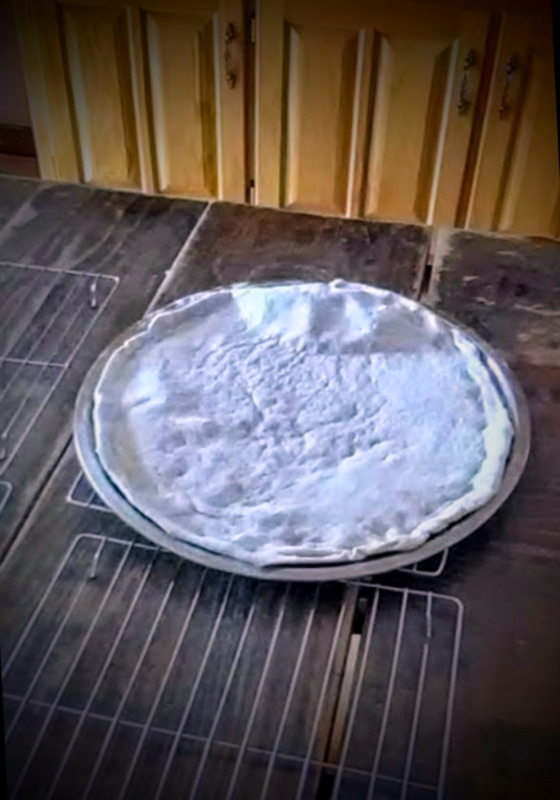 If you are using a cookie sheet, making two smaller crusts, set side-by-side, can be easier. Fit the dough onto the greased pan. Prick with a fork if you wish to prevent air bubbles. Bake 5-7 minutes in a 400* F. oven. This is not the total baking time, but will seal the crusts a bit against invading tomato sauce later. 1. Bake 5-7 minutes on an oiled baking sheet or pizza pan (you may sprinkle on cornmeal, as well, to help prevent sticking). 2. Freeze crust for later (see note below), or put on toppings and finish baking. 3. Bake 15-20 minutes, depending on thickness of toppings and desired crispness of crust. Serve hot, like usual. Note: Leftovers may be refrigerated, and either reheated, partly covered (foil works well), or eaten cold. ...but was not pricked before baking. The large air pocket may crack open during the topping process...but shouldn't matter a great deal. Cool crusts on racks a few minutes. You may begin adding toppings, beginning with tomato sauce, almost immediately…but it is wise to allow some steam to escape first. Place waxed paper sheets between crusts, then bag or wrap in plastic wrap. Or, you may bag crusts individually in 2-gallon bags. Store in freezer, lying flat and without other items on top of them. 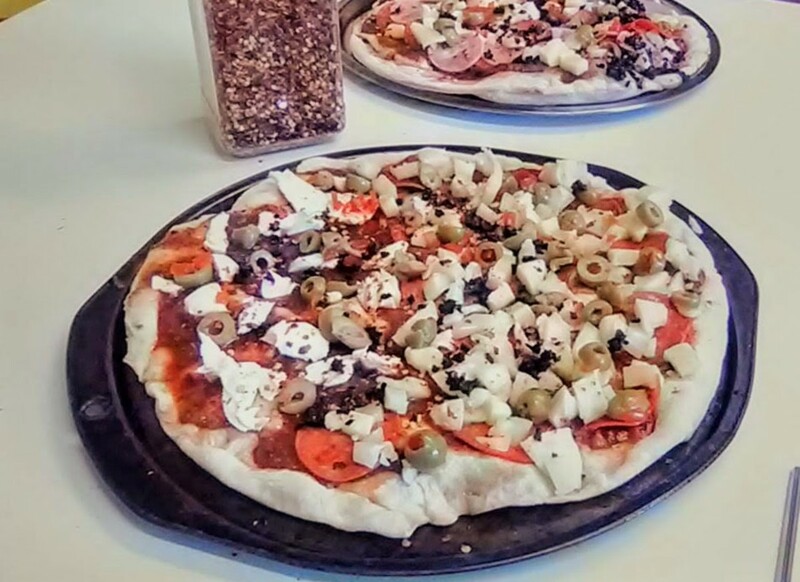 Putting toppings on the pizzas can be the best part, if you have a variety of toppings and a few hungry - but helpful - people. Greens - arugula, cilantro, etc. These were 3 meat+, with homemade goat mozzarella cheese cut in meltable chunks. And four pizzas disappeared in nothing flat, at a family lunch. 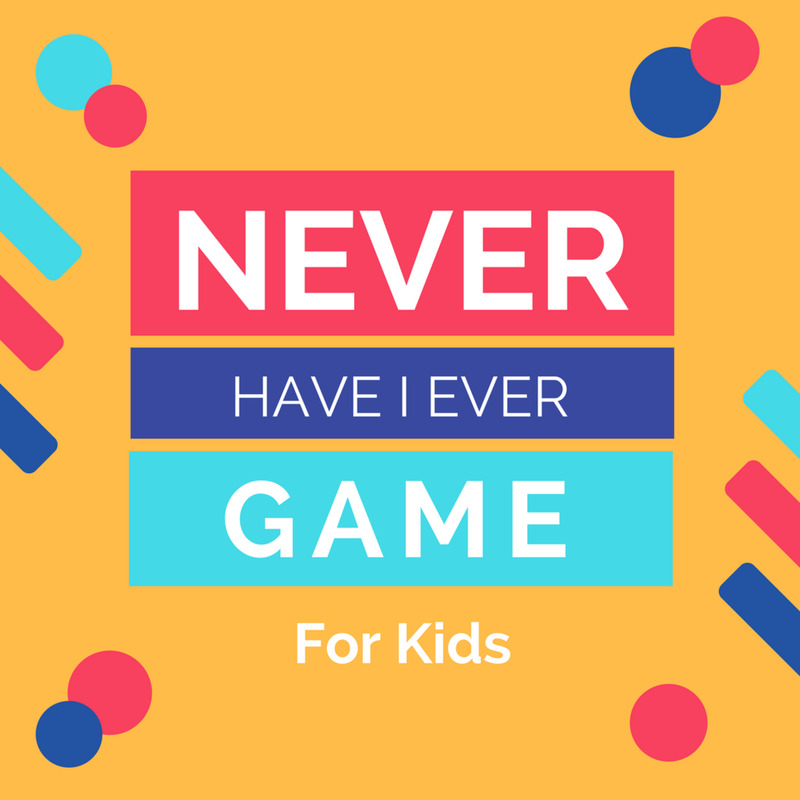 Did You Enjoy Making The Pizza Crust Recipe With Your Little Ones?